Doctor Who: Revisiting SILVER NEMESIS | Warped Factor - Words in the Key of Geek. November 23rd is an historic date for Doctor Who fans. Why? You ask. Because it's the broadcast anniversary of Silver Nemesis of course! To celebrate the occasion Tony Fyler meets his nemesis. For the twentieth anniversary of Doctor Who, the Production Team brought us a multi-Doctor extravaganza and, all in all, a pretty big deal in The Five Doctors. For the twenty-fifth anniversary, they gave us…erm…Silver Nemesis. 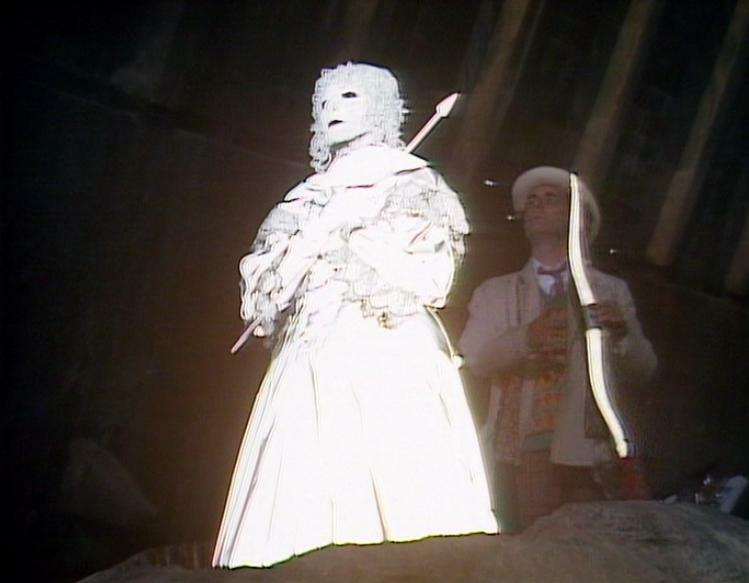 You can get all kinds of metaphysical about Silver Nemesis if you really want to – and indeed writer Kevin Clarke originally did, pitching a script where the question of who the Doctor actually is would either be revealed, or tantalizingly teased, the idea being that the Doctor was actually God. Read that how you like – he’s been to the point of the Big Bang a couple of times in various stories, so you could argue he’s got as much of a claim to the title as anyone else. Clarke’s idea of the Doctor as God ‘who keeps getting things wrong, which is why he pitches in and tries to save things’ didn’t make it through in any explicit way to the final story as broadcast, meaning what we ended up with was three episodes of good-natured runaround nonsense, with three power-blocs and three parts of a living statue which had to be combined to become effective, and which, when that was achieved, would more than likely bring about the end of the world. Somehow. For…y’know, Reasons. In terms of power-blocs, you could hardly get more disparate groups. 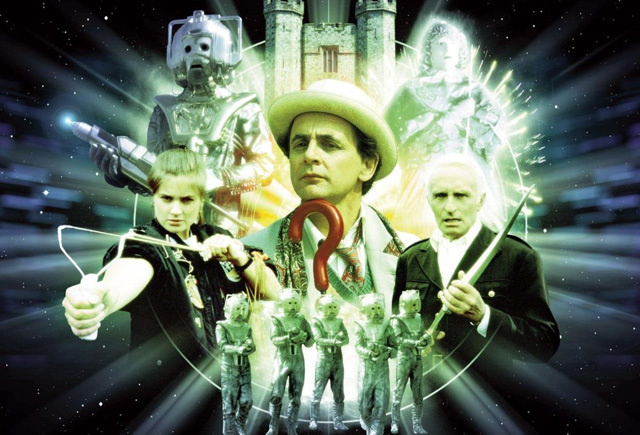 The Cybermen were due a return to do battle with the Seventh Doctor, so they’d be one power-bloc – no particular reason is given for them wanting the Nemesis statue, other than a vague plan to turn the Earth into New Mondas; again, it’s not particularly clear how the statue will help them achieve this goal, but that’s the Cybermen for you – the most illogically plotted kings of logic ever devised. For reasons that bear no examination and get no explanation, a group of Nazis who’ve been hiding out in South America, as per The Boys From Brazil, are the second power-bloc. There’s a degree to which this fits in with 80s phenomenon Indiana Jones, inasmuch as it gives credence to the idea of the Nazis having a special interest in occultish objects that could help them win their interminable war against…well, pretty much everybody who isn’t them. Nevertheless, it’s fairly random and bonkers. And for reasons that are pretty much entirely down to Clarke’s fascination with Elizabethan melodrama, a 17th century Satanic sorceress named Lady Peinforte and her supposedly criminal stooge, Richard, are power-bloc number three. Ladies and gentlemen, let’s play our game, as the Nemesis statue (carved from the Time Lord weapon, living metal Validium) returns to Earth, interrupting the Doctor and Ace’s enjoyment of a concert by modern jazz legend Courtney Pine. The statue needs its three components to achieve critical mass and be the harbinger of doom that everybody seems to want it to be – the body, the bow and the arrow. Once you understand that, you might as well run around for fifty minutes – the cast do. It’s very much a case of each of the power-blocs having one of the elements, and the Doctor and Ace nipping in, darting through their legs, stealing one or other of the elements to prolong the screen time until the Doctor’s ‘ready’ to assemble the full statue, at which point Silver Nemesis becomes altogether a different thing, a kind of re-tread of Remembrance of the Daleks, just two stories earlier. The elements that separate Silver Nemesis though are interesting. First, the Cybermen have an enormous invisible war fleet of thousands of ships in orbit, to add a piquancy to the whole ‘we’re all going to die if this goes wrong’ story-thread (and to echo the Dalek fleet that was there just weeks before), and then there’s Lady Peinforte with her knowledge. Lady Peinforte is probably the only strand of Clarke’s original idea that the Doctor is God which remains in the whole of the story – she claims to know the Doctor’s secrets, going back at least to the Old Times (rather reinforcing the general Andrew Cartmel idea that the Doctor at the very least is ‘not just another Time Lord’). The frisson of the idea that the Doctor’s secrets might be revealed for his 25th anniversary is a delicious one, however quirky a reading it might be to say that actually, our Time Lord hero is God. But in some respects, it’s a hand that’s overplayed right at the end, when the Doctor calls Lady Peinforte’s bluff and demands she tell the Cybermen what she knows. ‘The secrets of the Time Lords are of no interest to us,’ declares the CyberLeader. Despite having run around for a couple of episodes to try and get their tin-plated hands on one of the secrets of the Time Lords. Yyyyeah – ok, gotcha. While the essential plot of Silver Nemesis is ‘run around and then re-run Remembrance,’ there’s plenty to like about it. Firstly, the Cybermen make an impressive, if massively sudden entrance at the end of Episode 1 and the start of Episode 2, having evolved slightly from their form in previous 80s stories – there’s a hint of The Invasion-style boiler-suit about their basic bodies here, and we presume there must be some reason why they’ve decided glueing two of their fingers together is a tactical advantage. They don’t do what they’d grown more and more used to doing – exploding at the first hint of gunfire – which is positive, although it’s a forward step rather undone by the misfire of no-one on the writing or production side knowing that it’s really quite difficult to kill a Cyberman with gold. Arrow tips probably wouldn’t have done it before this story, though arguably gold coins fired with sufficient power might have. Nevertheless, for a story that starts off treating them so well, with a return to relative invulnerability to weapons fire, it’s unfortunate that the Cybermen are vulnerable to so many other people in so many gold-related ways in this story, as it rather relegates them to tin soldier status. The leader of the Nazis, De Flores, gives Anton Diffring another in a long career of men polluted by the ideology of supremacy, but sadly beyond Diffring, there’s little about the Nazis’ involvement in the story that makes much sense, and they’re painted in fairly stereotypical colours – accents, insignia, Wagner etc – that make them rather more caricatures than the British Nazis, Ratcliffe and Smith, of only two stories earlier. And for gloriously melodramatic comedy, heavyweight acting talent also comes in the form of Fiona Walker, pitching the role of Lady Peinforte perfectly as a person who is chronically dangerous, but who takes herself too seriously, resulting in what seems like inadvertent comedy. Gerard Murphy as her criminal but apparently good-hearted knave, Richard, hits the notes of comedy more squarely on the head, as is allowed him by his role as the comedy stooge. 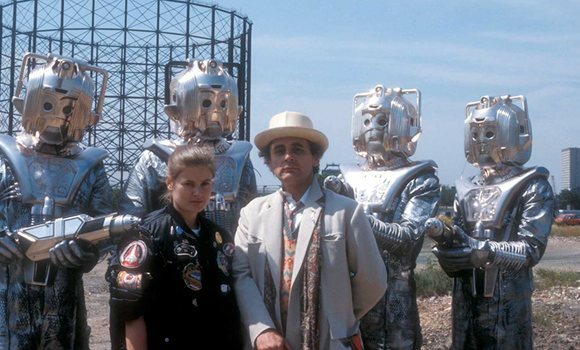 Ultimately, there’s nothing wrong enough with Silver Nemesis to make it especially unenjoyable – it’s three episodes of runaround fun with Cybermen, sorceresses and inexplicable Nazis. But in terms of deeply engaging the hooks of storytelling, it’s unfortunate that as a story it was so close, in both plot and the run of Season 25, to Remembrance of the Daleks. If you only have time to watch one, watch Remembrance every time, it’ll stay with you longer and for better reasons. If you have time for illogical fun with Cybermen, go with Silver Nemesis – by virtue of making them only one third of the threat, it’s their least heavyweight story of the 80s, and they’re freed from the companion-killing surprise of Earthshock, the ‘I’m just here to be hopelessly massacred’ vibe of The Five Doctors, and blood-soaked sadistic streak of Attack of the Cybermen. There’s not a whole hell of a lot of plot to the story, but if it’s an exciting, mindless romp you’re after, Silver Nemesis is still up to the job.